Glendale river View is a traditional family holiday home situated above the Waiau river, 2 minutes walk from the Doubtful sound departure point. Awesome river, bush and mountain views. Gas water heating and bathroom with seperate toilet.Quality comfortable beds and leather lounge suite. Stunning views down the river to the Takitimu mountains and across the river to the native bush and Mountains of Fiordland National Park. 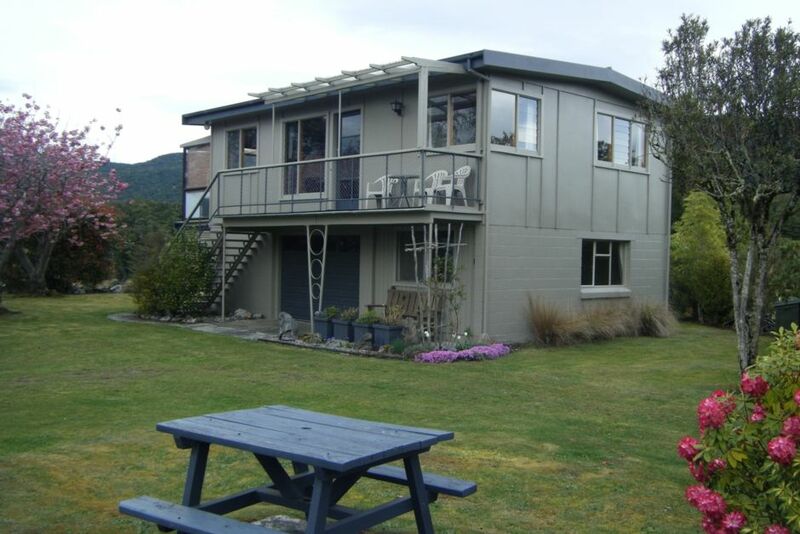 A sunny home, two minutes walk to Doubtful Sound Cruises and walking track departure points. Moments to Manapouri Lakefront and shops. This home provides it all. Glendale is fully furnished with comfort in mind. Gas energy saver heating with additional electric heating available. New carpet installed in 2015. Glendale is a family friendly, self contained and independent house with a fully fenced large rhododendron filled garden. A circular driveway provides good access. Put the boat in the water, bring home the trailer and walk 2 minutes back to the boat. From the balcony or the dining table enjoy the tranquillity of the many acres of native bush and bird life of this world heritage area. Manapouri is a Southern Scenic Route town. The departure point for Power station and Doubtful Sound Cruises, also en route to Milford Sound. It has a population of 300, a general store, cafe, petrol station, hairdresser, hotel and restaurant. 20kms scenic drive to Te Anau with a variety of shops, cafes, supermarkets, banks etc. Note: $150 for 1st 2 people $15 each extra person after that. Pets allowed outside with prior approval. Steep stairs between levels, not suitable for disabled. Quality, comfortable beds and leather lounge suite. Gas energy saver heater. Extra electric heaters. This is an old family fishing home...rustic, clean, well supplied and the beds are fine. But...the bathroom is downstairs some rather precarious steps, the toilet is unheated(the sink and shower are in a separate heated room), and the hot water often went off in the midst of a shower or dishwashing....only to reappear a few minutes later. Two beds upstairs ( one behind a curtain) requiring a stairs negotiation during the night. The other bedroom is downstairs, and to go outside, one must open a garage door...or go upstairs and down again the outside steps. A bit funky for the price. Great location for Doubtful Sound trips. Our water is heated by gas & we have instructions in our house manual explaining how to flick the switch over to the spare gas bottle if the water starts going cold. There should not be a problem with hot water if instructions are followed. I was also available by phone but did not receive a call or message from this guest or I could have sorted it immediately. We are building a permanent wall where the curtain is to close off the 2nd upstairs bedroom next month. Lovely spot with nice view of river, close to walks. Lovely spot with nice view of river, close to walks. Had everything we needed to be comfortable. The place was perfect. Cozy and has a nice little sunroom where you can read and have a view of the river. Perfectly nice place to stay, a little old school but thats exactly what we wanted. Perfectly nice place to stay, a little old school but thats exactly what we wanted. Washer and dryer were great. Literally a 5 min walk to the ferry terminal. Be aware there is no WIFI. Our listing description and photos are accurate. Broadband and dishwasher are not advertised so shouldn't be expected. I'm glad you enjoyed the lounge and balcony though.